Hey - I'm Wes Bos. I make web development courses. I also make stickers. Want some? for $5 USD, I'll mail you a pack of 18 stickers anywhere in the world. I only have 0 packs left. Once they are gone, they are gone! Huge thanks to WPForms for paying for the printing of these stickers. It helps keep the per-pack costs down. WPForms is the best drag & drop WordPress form builder in the market. You can use it to create simple contact forms, beautiful online surveys, email signup forms, payment forms, and so much more. It comes with powerful conditional logic and integrations to offer you the flexibility you need to create custom forms for your WordPress site. Check it out over at WPForms.com and enjoy the bear sticker that is in your pack! A few times a year I print new packs and will sell them on this site. Along with being a great designer, and front end dev - he also has a Front-End Careers newsletter you should sign up for. Pat also once sent me 8 bottles of hot sauce. Cool guy. 3-layer Holographic silver CSS. The next time one of those React folk start talking about how CSS is broken, you can just flash this in their face and they will slowly fall asleep. Idle Hands Build Nothing. A constant reminder to keep building things. This is a quote from a song by Levi the Poet. "Idle hands build nothing that you can call your own"
Advanced React - matches my latest course. CSS GRID. This one is so sick! 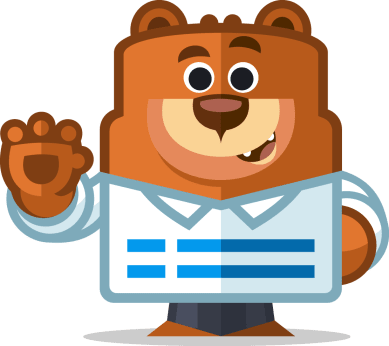 WPForms Mascot — cute little guy! Syntax Podcast. For the crew who tune in twice weekly for the Tasty Treats™. JS on the server? Why would anyone ever do that? ahhhh! I have so many questions! 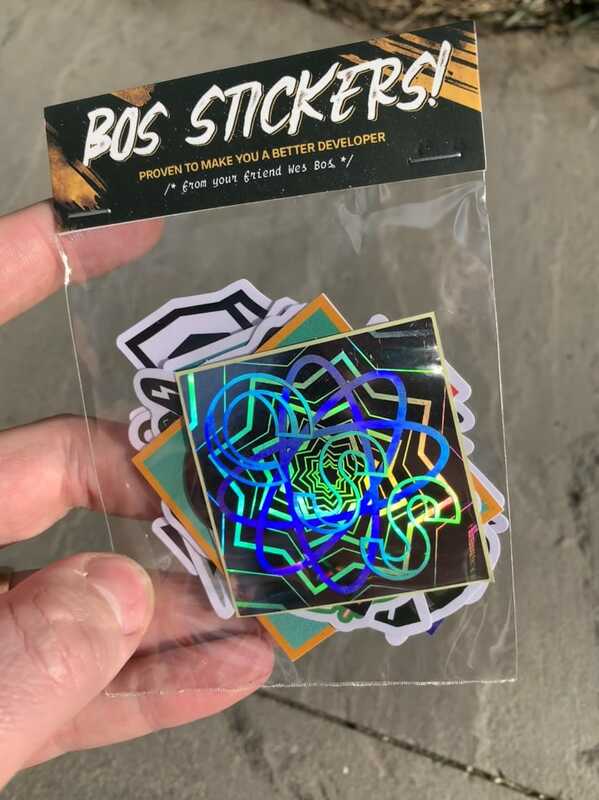 Selling these stickers is a bit of a logistical challenge - I've got it mostly figured out but I ask that you please read these FAQ before emailing me. Can I pick which ones I want? Do you have any of the old ones left? Nope. Maybe I'll print more of the popular ones. Really anywhere in the world? Yep! As long as you can receive a letter in the mail. Some countries are slow though - see below. I want to ship somewhere other than my billing address. Use the paypal checkout then. Where are my stickers? What is the tracking number? Please provide me hourly updates! The stickers will be mailed out via standard letter mail a week or two after you buy. I'll email you when they are shipped out. They take anywhere between 2 days and 2 months to get to you so please be patient. There is no tracking number. If they don't show up, I'll gladly refund you, but that is all I know about their whereabouts so please hold off on asking me where they are - I don't know! US, Canada, Australia and most of Europe usually will receive theirs within a week or two. From my experience the rest of the world, including Mexico, arrive within 1-2 months. Most of Africa and India is all over the map with deliverability - sometimes it's a few weeks and often they do not arrive at all. I'll refund you if this happens but that is all I know about this. It's been two months and I haven't received mine yet. If yours don't show up after 2 months after shipping, I'm happy to either refund you or send a second pack out. I want you to get the stickers as much as you do, so let me know! I'll pay for the extra postage in this case. Can I buy as many as I like? Sure - just check out a few times. They will come in separate envelopes each time you check out so I can avoid the envelope being classified as a parcel. Sometimes they show up on different days even though they are mailed on the same day! What kind of stickers are they? They are matte PVC - often referred to as "vinyl stickers". The holographic one is made from magic, science and lazers. I work for a company and wish to sponsor the next batch of stickers. Can we? Where did you get the stickers made? Yep - log into your account. This is the same account as my other courses. 😢 You are sold out! When will you get more? Soon™ Stickers are a huge logistical hurdle so I only do them once or twice a year. Success! I'll mail them to you in a week or two. Delivery is usually pretty fast, though it may take over two months to get to some locations. Please read the FAQ for more! I will ship the stickers to your billing address. If you need to provide a different address than your billing address, use the PayPal option and specify your address when you come back from paying with PayPal. *I promise I spelled my email correctly and I won't email you when I discover I spelled my own name wrong. *I promise my shipping address is correct and not an old address I moved away from 6 years ago but I forgot to update my autofill *I will read the FAQ before I email you about shipping times or anything else: (yes I moved this checkbox so you would read it) *I triple checked all the info above and it is correct! I won't email you to change it because I messed it up. You'll authorize the purchase amount on paypal and then come back to input your shipping address.